Don't you have when students don't have their homework and it takes forever to get it in? 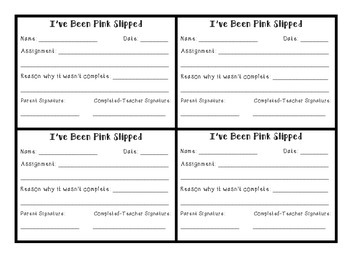 Well with this slip, students must explain why the assignment is not in and then their parent must sign it. For my kiddos, their parents never knew they had missing work and the kids could care less...well now they have to know and every day the work is late another is attached to this one and sent home again! Enjoy!